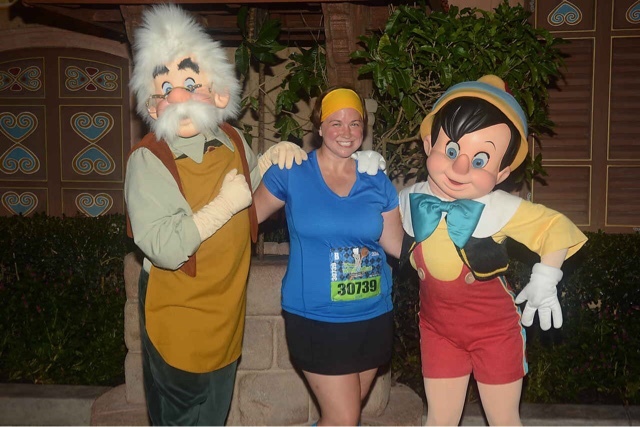 After running my first runDisney races in 2015, I was hooked and couldn't wait to plan a 2016 race getaway. We ended up planning a weeklong family vacation that would end on Wine & Dine weekend once again. And with a new menu of racing choices including the addition of a 10K and Lumiere's Two Course Challenge there was a lot of excitement in the air during the months leading up to the event. Due to our travel schedule, I wasn't able to do the half marathon so the inaugural challenge was out for me, but I was thrilled to be part of the Ratatouille themed 10K. 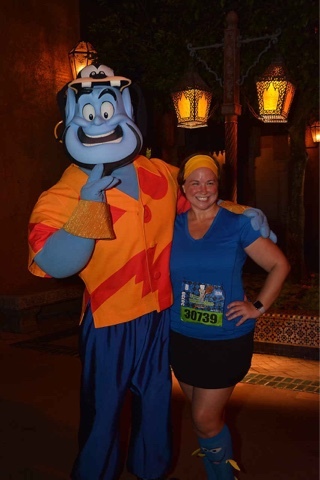 The 10K was set to run on Saturday morning with the typically early runDisney start time of 5:30AM. I was staying offsite at the Hilton Orlando Bonnet Creek so I had to provide my own race transportation, which I did via taxi service to the start line at Epcot. I arrived right around 4AM and couldn't be more excited to be at the party that greets runners. Characters, concession sales, and a DJ all provide a fantastic atmosphere to get pumped up for the race. Since I didn't have much else to do until the start time and I was by myself, I hopped in the very long line to meet Remy and Emile from Ratatouille. The DJ kept announcing that the characters would leave at 5AM and I wasn't sure if I was going to make it. Remy disappeared about 4:45, but I remained in line for Emile and ended up being the last person who got to meet him before the race started. After meeting Emile, I headed over towards the corrals. runDisney is nothing if not efficient at getting their races off and running on time. By the time I made a stop to use the bathroom, corral A had already headed to the starting line and my corral, corral B, was already opened up to follow. With the typical runDisney fanfare including music and fireworks, the first corral started promptly at 5:30 and corral B was off about 10 minutes later. This was my first runDisney 10K and, although this was an inaugural race for Wine & Dine weekend, my understanding is that it was a familiar course. The first 3 miles were on the roads out and around Epcot. There were two character stops along the road including the penguins from Mary Poppins and Flik and Princess Atta from A Bug's Life. I was feeling energized and neither stop was overly appealing to me, so I kept on running past those characters. Shortly after the mile 3 marker, runners enter Epcot through a backstage area and burst into World Showcase inside the Norway Pavilion. The cast members inside World Showcase were phenomenal - cheering runners on in languages native to each country! This also led to the next few character stops which included Geppetto and Pinocchio in Germany and the Genie in Morocco. I was feeling like I needed some character interaction as I was already past the halfway point so I stopped for each of these. 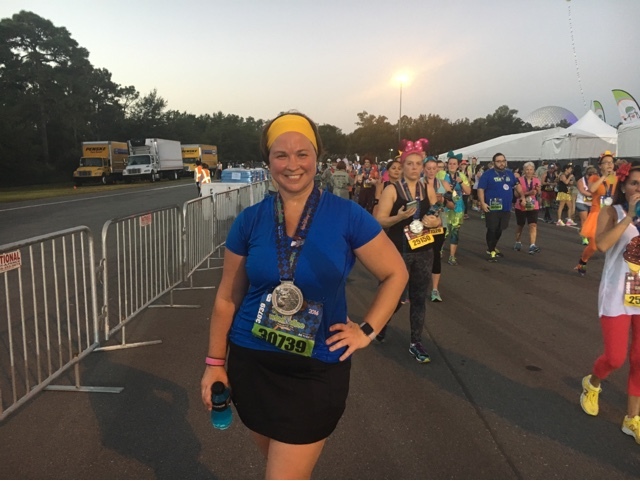 Runners then continued out of Epcot via the International Gateway to circle Disney's Boardwalk and the Yacht and Beach Club Resorts. Chip and Dale greeted runners at the ESPN Club and there were a lot of spectators out in the resort areas to cheer everyone on. As we re-entered Epcot, a large Sebastian met us and the party continued into the United Kingdom. 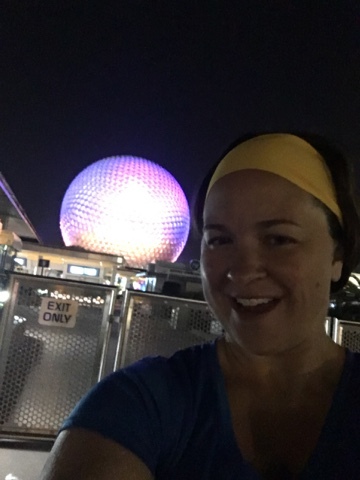 We exited the park after running through Future World and accepted the inaugural bling in the parking lot near where we started. As always, the course was flat and fast. 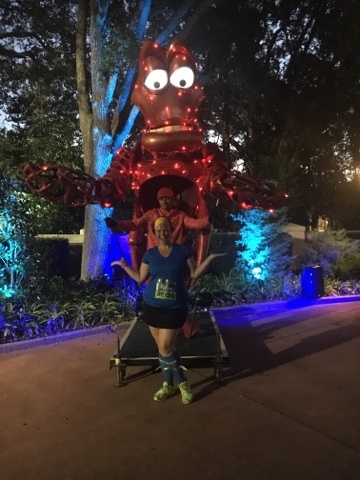 I have to say that once again I was incredibly impressed with runDisney. Everything was organized, well-supported, and fun. 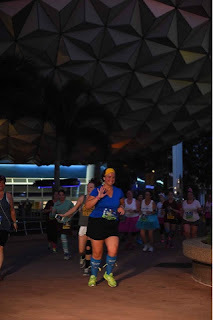 I can't say that any other races I've run have come close to the experience of runDisney. I was also really pleased with the runner's etiquette on display this week. 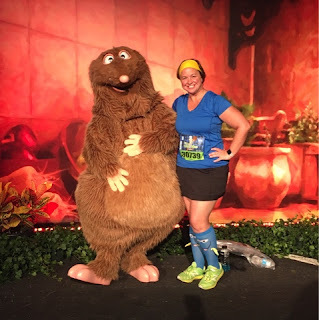 Many runDisney runners follow Galloway's run/walk intervals. Everyone I encountered on the course was signaling breaks and not walking in large groups. I would definitely come back for another Wine & Dine 10K and can't wait for the Glass Slipper Challenge in about 100 days! !